Pusat Sumber SMK Bandar Utama Damansara (3): Merdeka! 500 years ago; this your history teacher has often pointed out; the Portuguese set foot on the glory that is Malacca, for the Gold, Gospel and Glory that is theirs. Down the centuries, this tiny piece of land encompassed the entire nation and had switched hands for over 40 decades, each new master forcing their identity on the populace in turn. Finally, on that fateful day in 1957, Tunku declared us free from the yoke of our master. Merdeka! he had declared. Even so, after 54 years of nation, have we truly embraced the true spirit of this call? Surely, globalisation has made us (including both us administrators, but especially the other one) the bearers of an alien identity that could tear the fabric that is our beloved nation, Malaysia, into utter disunity. Therefore, it is necessary for us to kindle the embers of patriotism within us. This spirit would encompass all lenses of society, indiscriminate of race, status and creed. However, this should never give in to the blind patriotism that would lead ourselves into oblivion in all aspects of life. We, as the caretakers of the Earth, should unite to champion the rights of all of humanity. This is where globalisation should play its allotted part in bettering humanity and their planet. Balance, therefore, is essential in preserving this state of matters. So, after hearing me rambling on about the overall world view and thrashing individualism into tatters and you give me that I-don't-care-about-your-dialectic look the next time you see me after reading this post, I would like to cherish the motto of the School Resource Centre, 'Towards Success, We Work Together' With this in mind, we would truly be a citizen of the world. 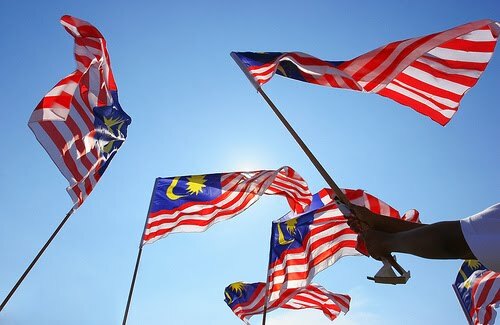 With this, I wish all a Happy 54th Merdeka and that many more will come.